Product #150 | SKU 8-003-0050 | 0.0 (no ratings yet) Thanks for your rating! 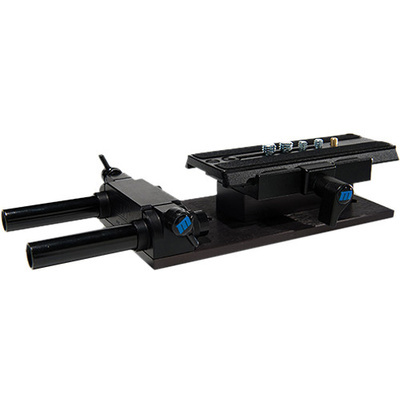 As the heart of Redrock Micro 's microSupport System, the microSupport Baseplate w/4" 15 mm Rods is designed to attach Redrock's microMatteBox to standard video cameras, such as Sony EX, Panasonic HVX and many other prosumer and professional camcorders. Made of aircraft-grade, machined aluminium, the baseplate's quick-release system, integrated horizontal/vertical adjustment knobs, and ability to mount to nearly any camera, make it indispensable to accessory support. The included 4"(10.2 cm) 15 mm microRods fit the baseplate or any other standard 15 mm system, and are made of rugged, precision-machined stainless steel.